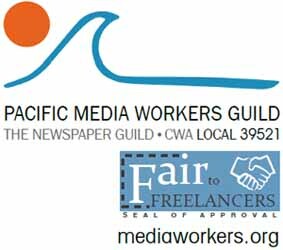 After five months trying to negotiate a contract for workers at the San Francisco Chronicle, the Pacific Media Workers Guild said it is appealing for public and labor support to win a fair settlement with the Hearst Corp., the Chronicle’s New York-based corporate owner. Chanting “Shame on you,” a reference to Mayor Ed Lee and his effort to remove a political opponent from office, as many as 100 protesters attended a rally under the balcony of the mayor’s of office on September 17, calling for suspended Sheriff Ross Mirkarimi to be reinstated. Investigations, both internal and outside, have revealed that content outsourcer Journatic supplied fake bylines to its publishing customers which include the Chicago Tribune, Chicago Sun-Times, GateHouse Media and Hearst-owned San Francisco Chronicle and Houston Chronicle. Tax the Rich for Schools and Services – Don’t Let Them Silence You! On November 6th, with two statewide initiatives, we will decide whether to reverse decades of tax policy that has enriched the wealthiest while starving basic public services, or we could pass a deceptive measure that will eliminate unions’ ability to fight for our priorities. Managers of the Hearst Corp.’s San Francisco Chronicle plan to continue using a controversial overseas content mill that fabricated bylines.